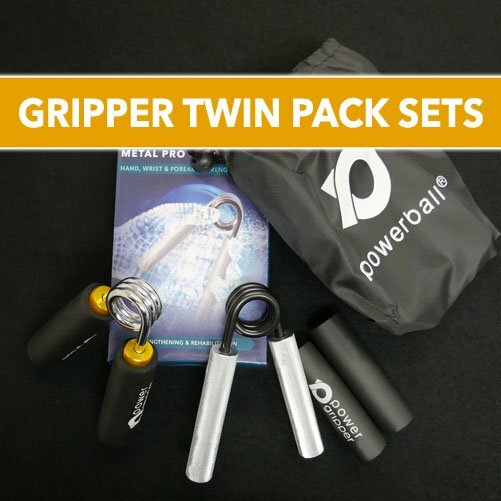 Build strength in the arms & wrists for enhanced workouts in the gym; train your muscles for a more powerful grip or rehabilitate injuries in the upper limbs - the new ALL-METAL Grip Strengthener from Powerball® provides everything you'll need in one powerful, compact device. Simple to use: Compress the bars together for a couple of seconds at a time or relax and tighten your grip for concentric and eccentric strengthening – you control the intensity of your training; simply "pick up and squeeze" for instant effect. Professional quality: Each Grip Strengthener is supplied with a pair of rubber grip covers that can be slipped onto the handles for extra protection and gripping comfort if desired. A convenient travel bag is also included.